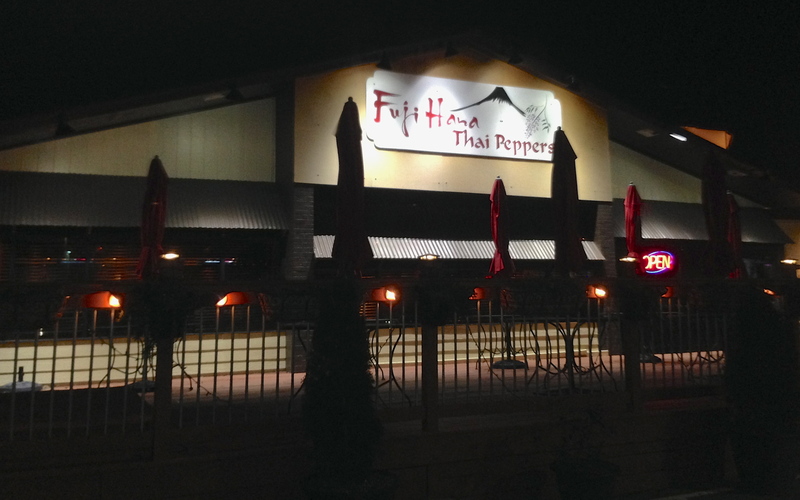 On the coldest night in 40 years, Date Night is invited to a media preview of the new sauces and late-night dessert menu at Fuji Hana Thai Peppers. Chef/owner Nick Chompoonich is opening the doors late on Fridays and Saturdays, until 1AM at his Thai-sushi restaurant in Kennesaw. His hope is that young professionals will want to get dessert at the end of a fun night, and by staying open late, it gives OTP residents a choice other than Buckhead for their late-night sweets. He’s also introducing the bottled version of unique signature sushi sauces. 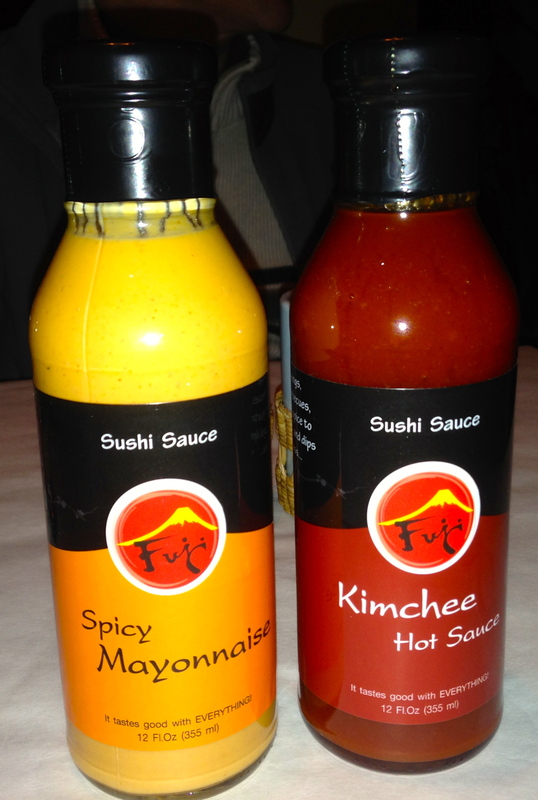 We start off sampling two of the sauces. The spicy mayonnaise tops the caliente roll, rice with a crunchy piece of fried fish in the middle. 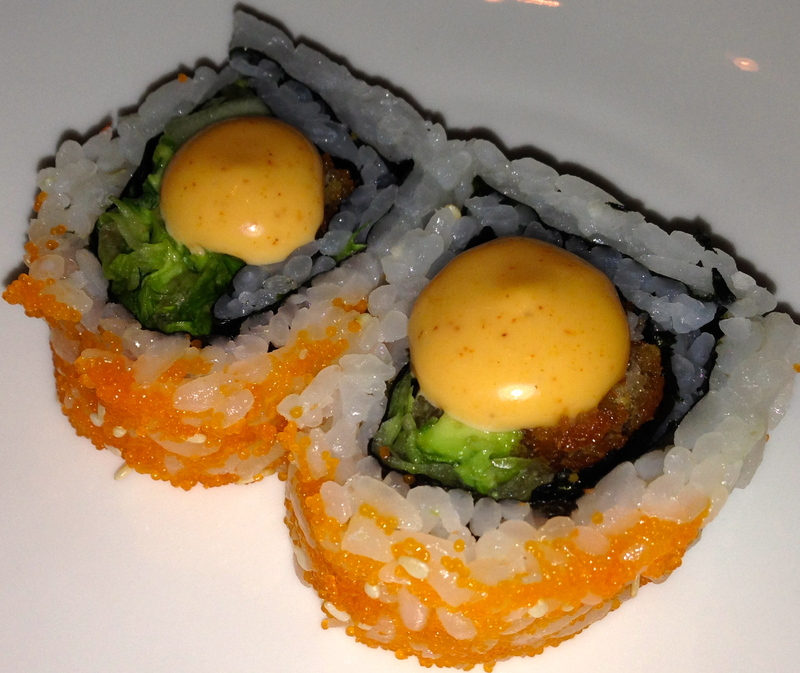 This roll was not too spicy, and we liked the crunch of the fish, offset with the soft rice. 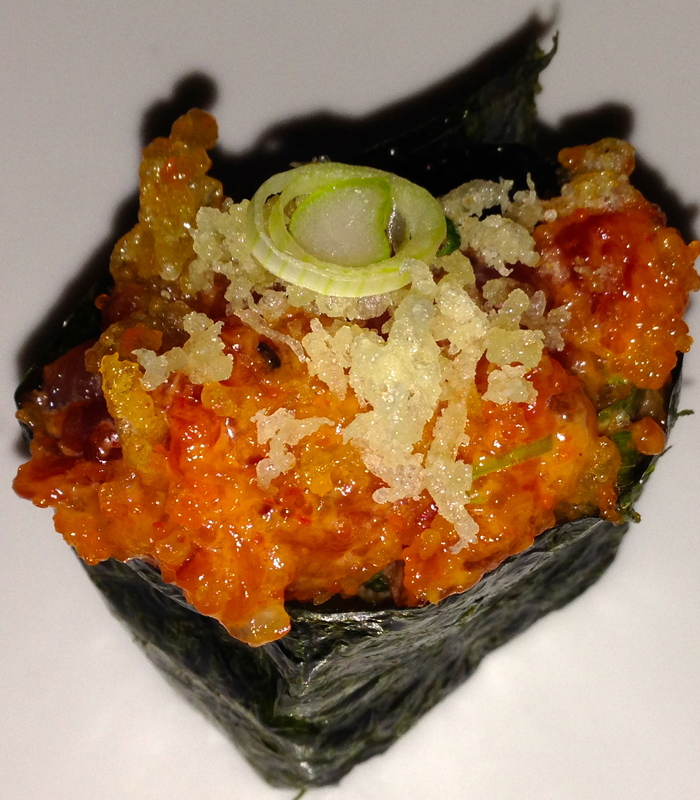 Tuna tartare features ground tuna mixed with the kimchee sauce. This taste was much spicier than the caliente roll. Both sauces would be excellent for cooking, or just dipping tater tots, which is what we do with the mayo the next night. 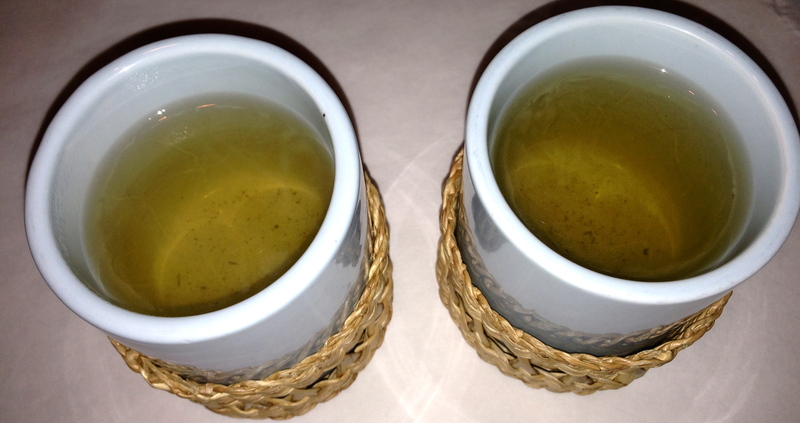 Fortunately, we are drinking two cups of fragrant jasmine tea to fight the cold. Chef Nick has come up with an interesting concept for his desserts. 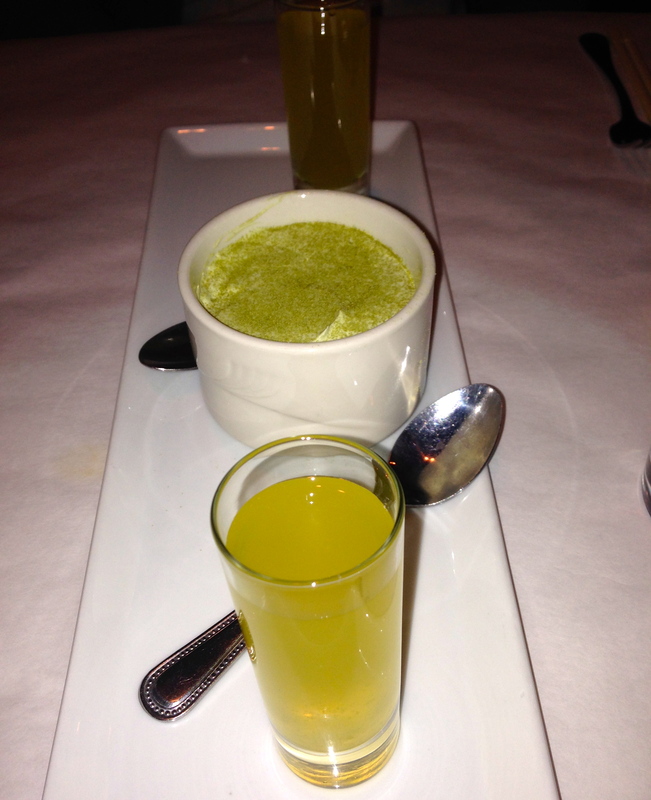 Included with each dish is a cordial to complement the flavor and coloring of the dessert. 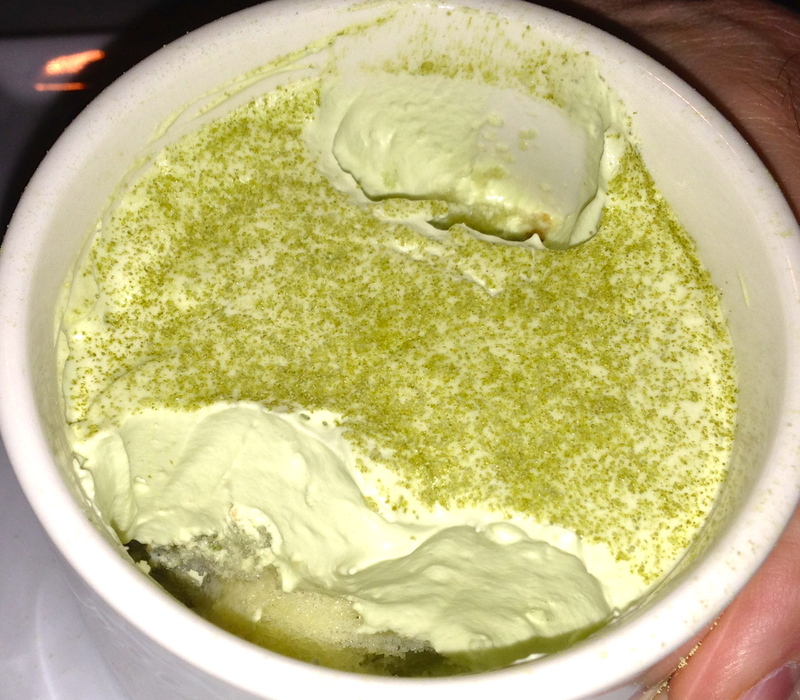 The first presentation is the green tea tiramisu. Instead of the coffee taste most associated with this dish, you get tea flavorings. Mascarpone makes this dessert light and fluffy. The cordial has St. Germain Elderflower and Albarino wine, which gives it a fruity taste to go with the tiramisu. 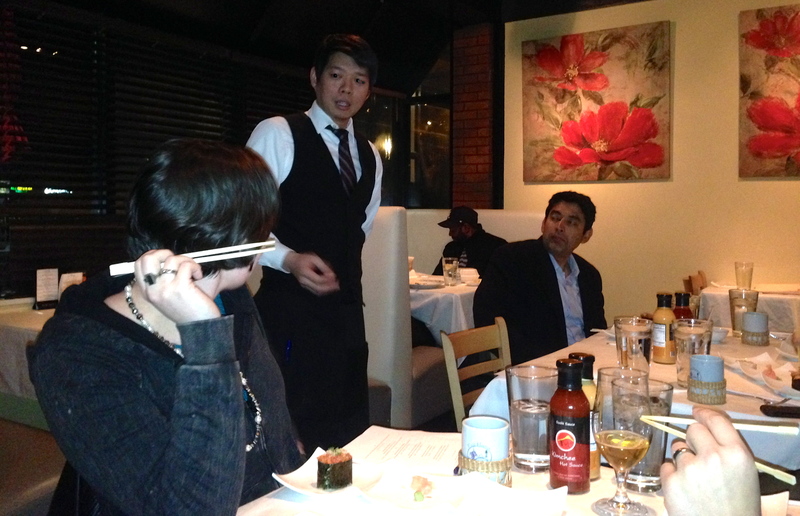 Chef Nick comes out and explains each dish and why he selected the cordial to go with it. 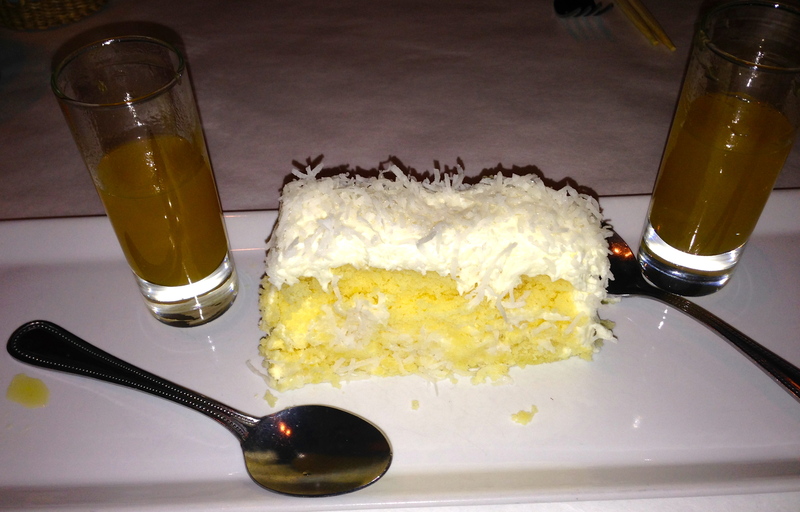 Next is a fresh, moist coconut cake. Accompanying it is the best cordial of the night, which has Gran Marnier and Riesling. A salted caramel pretzel cupcake comes out next. 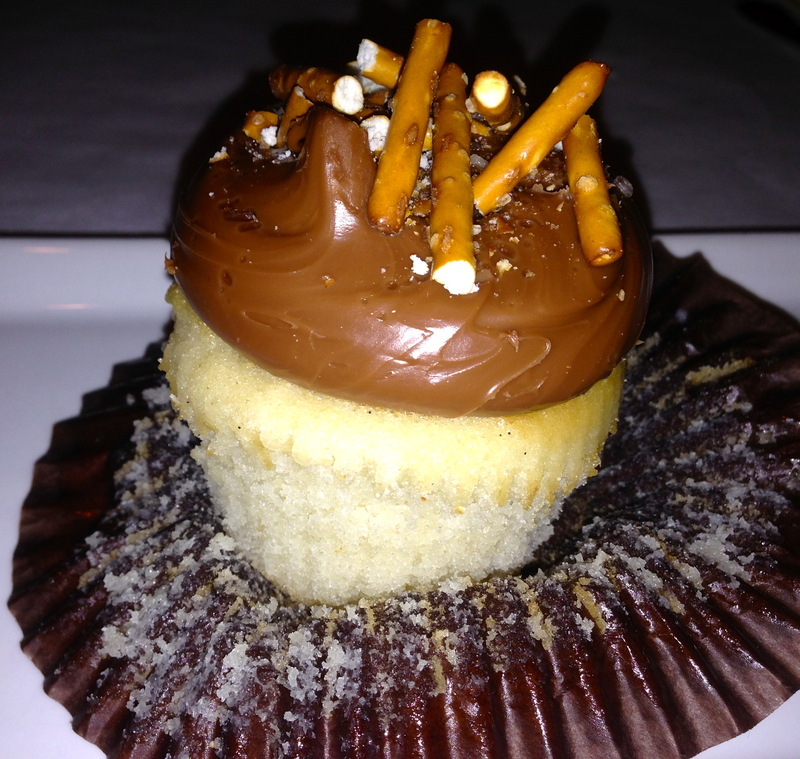 The cake and caramel are dense and the salty pretzels on top are a nice touch not often seen on dessert. The (not pictured) cordial is a mix of tequila and Sapporo beer. 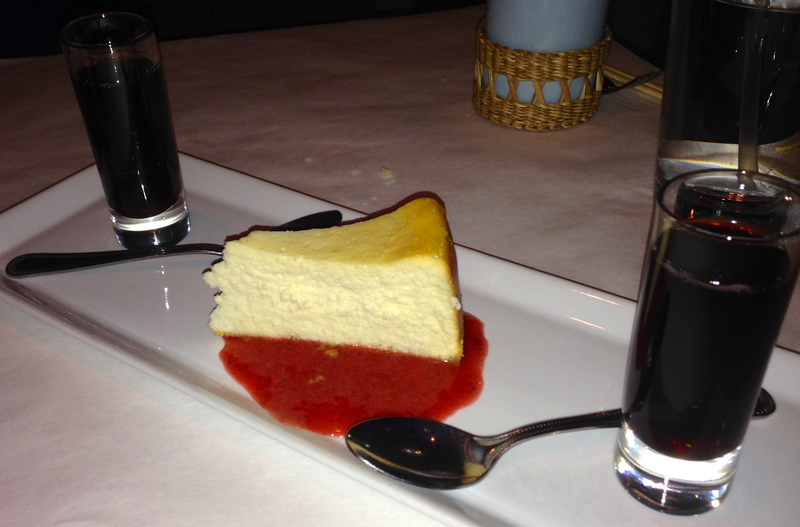 The grand finale is the New York cheesecake with strawberry sauce. This was a nice, light cake, not as dense as most cheesecakes. The cordial is dark red due to its ruby port base, and it matches the strawberries. The best dessert of the night? The Green Tea Tirasmisu. It’s worth another look and is the consensus favorite among those in attendance. Chef Nick is making the desserts fresh every weekend, right here at the restaurant. At $9-$10 per dish, which includes the cordial, it’s a good deal, and they are large enough to split. 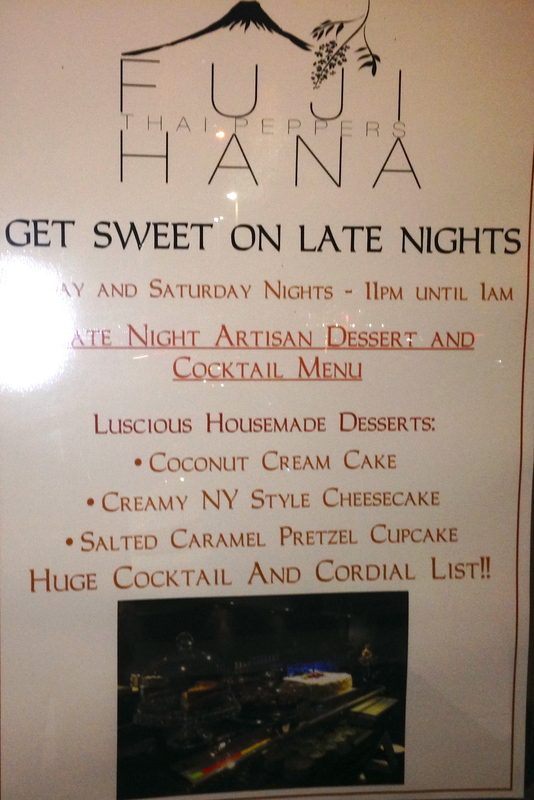 If you are in Kennesaw and you have a nocturnal sweet tooth, Fuji Hana Thai Peppers is ready for you. Full disclosure: Since this was a media event, we did not pay for our food at Fuji Hana Thai Peppers. We got to sit with some cool blog writers, including Emily and Adam from Spatialdrift and Malika from Atlanta Restaurant Blog. Our thanks to Jody Rosen and The Rosen Group for inviting us.